BSM comes from behind to score first conference win of the season. CHASKA, Minn. -- Matt Kocourek's goal, two minutes, 12 seconds into overtime, capped a Red Knight comeback as Benilde-St. Margaret's opened the new year with a 3-2 overtime win at Chaska. Although scoring first and taking a lead into the first intermission, the Red Knights had to come from behind to earn their first Metro West Conference of the season. After Colin Jacobsen scored at 7:51 of the third period to snap a 1-1 tie, BSM found itself needing a late goal to send the game into overtime. Goalie Carson Limesand came to the Red Knight bench for an extra attacker with 1:41 on the clock and, 27 seconds later, Jerome Newhouse tipped a Nate Clark shot past Chaska netminder Ben Urbanciz to tie the game at 2-2. Jerome Newhouse scored with 1:14 to play in the third period to tie the game. In overtime, the teams spent much of the first two minutes battling between the circles in each other's zone before Seamus Foley sent the puck deep in the Hawks' zone. 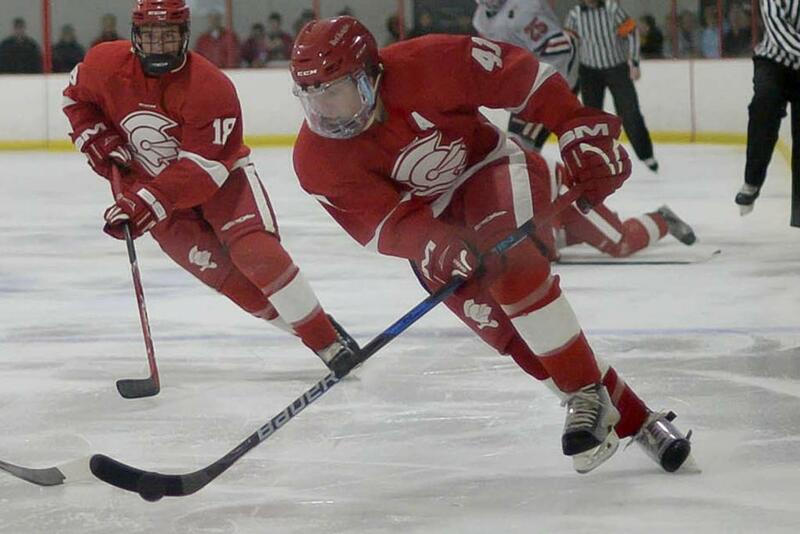 Jett Johnson won a battle for the puck in the right corner and got the puck to Kocourek, who scored from the bottom of the right circle to give BSM its second overtime win of the season. The Red Knights took a 1-0 lead in the first period when Joe Collins took a pass from Dylan Hoen and scored his ninth goal of the season. BSM held a 29-24 advantage in shots on goal with Limseand earning the win with a 22-save effort. The Red Knights return to action, Saturday, when they will face Hill-Murray in a 7:30 p.m. game at Aldrich Arena.